If your cat is not eating, it's a very serious condition that needs to be monitored closely. Cats will occasionally be fussy when it comes to eating a meal, but when a feline is off her feed for more than two meals, it is time to consider possible health problems. A cat may stop eating for a variety of reasons. It can be as simple as feeling bored with the same diet, or as serious as a bowel obstruction. When owner's pay attention to their pets each day, they will be accustomed to their pets' eating habits, as well as the occasional ignoring of the food bowl. The following are some of the common reasons your pet may stop eating. What Does It Mean if a Cat Is Throwing Up Clear Liquid? There are several issues that are directly related to cat food. The following may provide some insight as to why your pet avoids eating. Cats are much like humans in that they enjoy food that tastes good. They know when things taste bad and will refuse to eat food that has become stale. Food can become stale when it is stored in a warm or humid environment more quickly than food stored in a cool, dry area. If you live in a humid climate, store the food in a cool area or buy smaller amounts of food at a time to avoid spoilage. Cats prefer food that is warm or at the very least, room temperature. If your cat is refusing canned cat food that has been kept in the refrigerator, allow it to come to room temperature before offering it to your pet. Would you enjoy eating the same thing day in and day out? Your cat doesn't like eating the same thing at mealtime each day either. Variety is the spice of life, both for humans and felines. Tempt your cat's palate by offering her a variety of foods; if you do, your cat's appetite is likely to return quickly. Some cats simply won't eat when another cat or pet is present. When this happens, feed them in a separate area away from traffic and other animals. If your animal is allowed outside, she may have found another food source. Cats will eat a variety of wildlife if they are allowed outdoors. Popular food sources include birds, mice, moles, voles, baby rabbits, grasshoppers and even snakes. It all depends on what is available where you live and how adventurous your pet is. When your pet lives in a suburban area, she may also eat at a neighbor's home, especially if they feed their pet outdoors. While you have little control over this, it may be the reason your pet refuses food at home. Most dental problems will cause your pet to have very bad breath. 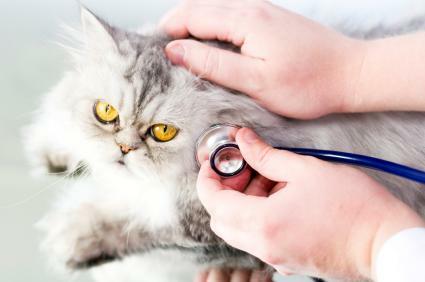 If you notice this particular symptom, take your cat to the vet right away. If your pet is experiencing any of the problems noted above or hasn't eaten for 24 hours, call your vet for assistance. Cat health not eating issues can sometimes lead to death because cats and kittens can quickly become dehydrated due to their small size. When in doubt, it is always best to err on the side of caution and make an appointment to see your vet as soon as possible. It is always better to take a pet to the vet for a proper diagnosis than to let her suffer while hoping the situation will correct itself.